The Future of Smilers, where do we go from here? In 2009 Royal Mail threw down the gauntlet to its key account holders and asked them what changes they would make to Royal Mail's range of standard Smilers Stamps. They did this in response to some complaints aired at the Royal Mail Key Account meeting at STAMPEX in September that the Smilers stamp range was perhaps too narrow and did not fully allow business sheet producers choices when it came to choosing an appropriate stamp for a specific business sheet. Adrian Bradbury recently contacted us and gave his permission to share his proposals with you. In his response, Adrian proposes a major re-think on the direction of Smilers Stamps for use with the Business Sheet products proposing a wider choice of stamps and themes from which sheet producers can tailor their selection to suit the subject of the sheet. We invite your comments and suggestions to add to Mr. Bradbury's excellent work reproduced below and we promise to publish your responses and invite Royal Mail to take on-board the comments of the Smilers collectors' contributing to this feedback. Please send your comments and or suggestion to Graham Howard or Chris Potts. One request! If you want to have a conversation with someone please feel free but don't use this web page as a substitute for a phonecall! I am genuinely interested in Smilers Collectors views on the original question posed by Royal Mail. "...what changes would (you) make to Royal Mail's range of standard Smilers Stamps." On page 35 of the November Key News, Steven Thompson asks: We are currently reviewing the range of Stamps available for use through the Business Customised and the Smilers® service and would appreciate any ideas for themes you would like us to cover. It would also help us to understand which of the Stamps in the range you would particularly like us to remove and or update. As one of the most prolific users of the Business Customised Service I have a vested interest in the outcome of any changes and therefore feel compelled to make the following comments and suggestions. My comments do not relate to the Smilers® service. I believe that the current availability of stamps for the Business Customised Service is a disaster! It has been built up over the last eight years with no rhyme nor reason. The vast majority of business customised sheets which have been produced in the last few years have had to rely on the union flag stamp, because very few of the other available stamps are appropriate. Scrap the existing range of stamps for Business Customised Sheets and make a fresh start with some new designs. Scrap the large stamp/small label format, thus restricting the new range to small stamp/large label format. lot more cost effective making production more streamlined. The Kings & Queens, and Castles range would work really well with historical themes. Flags: at present only the union flag is available for use on Business Customised Sheets. Scotland, England (and soon Wales) exist as gummed stamps from the ‘Celebrating’ miniature sheets. There is currently no stamp featuring the Northern Ireland flag - why is this? fields design which does not fit in with the other three regions. A United Kingdom design is also missing. I have designed the top six rows in such a way that they could be used individually (i.e. ten of the same design to a sheet), or as a set of five (i.e. two columns of each of the five designs to a sheet). The current online Smilers service would remain unchanged (with the present 20 designs), unless of course it was considered that some of my suggestions would complement the existing Smilers range. There would of course be some overlap - i.e. certain designs would appear in both ranges, Business Customised and Smilers. New stamp designs cannot be exclusive to the Business Customised Sheet range and must be made available to the general public. However, this could easily be overcome by issuing a small self adhesive sheet of 1st class stamps with each of the new designs. Such a sheet would be a new concept for Royal Mail and I feel sure would be a good seller with Post Offices. To have a permanent range of say ten or twenty colourful and attractive 1st class stamps would, dare I suggest, be a breath of fresh air for most people who only ever see the Machin stamps and the Christmas issues. Agreed, but not as a self-adhesive miniature sheet, which is a pointless product as the stamps are not se-tenant. I think the flag stamps should be made available as booklets of 6 x 1st class, like the greetings stamps. The booklets should be standard issue in the countries - what is done for Northern Ireland I don't know, but maybe the ones in the Celebrating NI should be used. "I believe that the current availability of stamps for the Business Customised Service is a disaster! It has been built up over the last eight years with no rhyme nor reason. " I disagree with this - there are too many new stamps issued every year, and those are the ones that Royal Mail propose for public postage use. What he is now suggesting is a whole new range which will be used primarily for Business Customised Sheets, although as a concession they would also be made available to other collectors, and for postal purposes. Personally I think the Business Customised Sheets have been a disaster for philately. 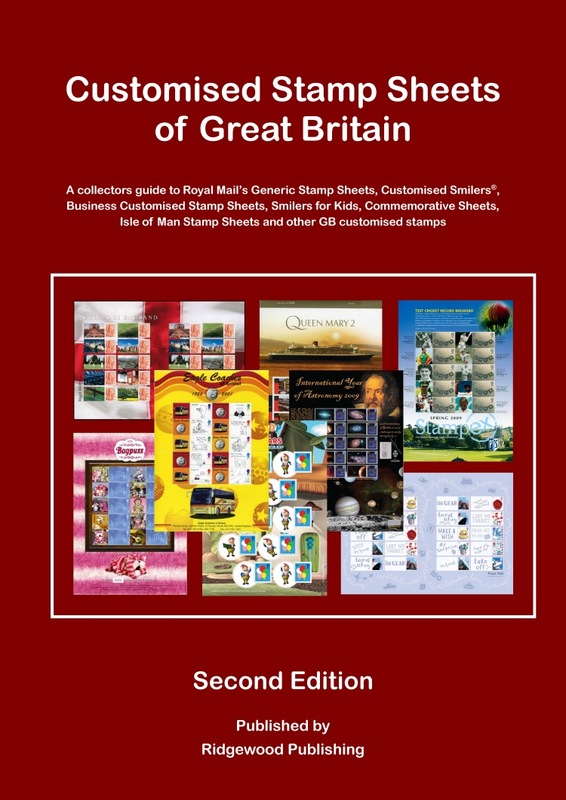 Not only have they enabled a lot of stamp dealers to diversify into creating expensive collectables instead of concentrating on serving the hobby, the success of these has encouraged Royal Mail to create Commemorative Sheets which are overpriced official issues (three in 2008 alone). Whilst I accept that any collector should be able to distinguish between official issues and expensive collectables, some of the latter have produced stamps not elsewhere available (different perfs, etc). This means that some stamps exist in uncatalogued varieties, produced only for these privately-commissioned sheets. It is not just the profusion of official stamp issues which have contributed to people deciding to stop collecting future issues. Oh dear. It seems we may be in for yet another avalanche of sheets. Of course a cover producer will want more designs to use, so he can produce more sheets to produce more covers to raise more revenue for himself. Whilst the current range cam be seen to be restrictive, we cannot have a "free for all" as this will make the whole idea of collecting 'Smilers Sheets' totally unaffordable. It is bad enough already that we have duplication - sheets with either rectangular or circular labels. It will be unfortunate if someone with a vested interest in making money out of these sheets is allowed to extend and increase the range - the Post Office/Royal Mail will then definitely be producing stamps purely as a revenue making exercise and not for postal use, and then where will it all end? The number of Business Customised sheets issued over the past couple of years has undoubtedly increased dramatically, but the relatively high number is clearly justified by the number of sheet sales being maintained. The quality of the sheets produced by the major suppliers, in particular those from the Bradbury stable, are stunning. Unfortunately, the limited range and now rather tired selection of stamps available to use in these sheets has not progressed in the same way. The new ideas for stamps put forward by Adrian should be seriously considered by RM. The regional flags and/or emblems and the modified versions of existing/previous issues are especially attractive and would I’m sure be popular with sheet collectors. From a philatelic perspective, what I consider to be particularly irritating is to see so many new stamps issued only in RM Minisheet format – I doubt these are ever used on mail and hence seen by the public. Stamps are their own advertisement and need to have wide usage if new collectors to be wooed. I especially concur with the suggestion that all stamps available for the BC sheets should be readily available for wider usage. The new collecting phenomenon of these sheets in all their formats (Generic, Smilers, Business Customised, Themed) should be nurtured and encouraged. There is a perception that a certain amount of ‘milking the market’ has taken place, and that may be true, but the market will only be maintained if the products available continue to be attractive (and affordable!). This could be an excellent opportunity for RM and the sheet producers to take this new collecting area to the next level, and I hope it succeeds along the lines proposed. John Vincent writes "The new collecting phenomenon of these sheets in all their formats ... should be nurtured and encouraged." I'm sorry, I disagree with this as well! Stamp collecting is stamp collecting. Collecting posters of Steam Trains, Ocean Liners, Elvis, Dr Who or pictures of Rugby Players is a totally different thing. There was never any need to combine the two. Business Customised Sheets were intended by Royal Mail as an extension of the Personalised Smilers - to allow businesses to produce 'corporate' stamps with their logo or another design, to use as postage. Sadly some leading stamp dealers and the PTS saw an opportunity to use the facility which became a license to print money. Royal Mail acquiesced as this increased their revenue as well. These souvenirs should never have been sold as philatelic items as the presence of the stamp is, in most cases, totally irrelevant to the subject of the sheet. Extending the range of stamps available for these products is not the answer - eliminating the stamps and producing plain posters is much more prefeable. Give us back the hobby of philately ! !